April 28 (Bloomberg) — Lan Airlines SA, Chile’s biggest carrier, reported a 35 percent drop in first quarter profit after losing $57.9 million from wrong way bets on fuel prices. Net income slipped to $65 million from $99.6 million a year earlier, the carrier said in an e-mailed statement today. The airline reported earnings under International Financial Reporting Standards for the first time. Operating revenue fell 15 percent to $882.2 million. Carriers worldwide including Cathay Pacific Airways Ltd. and Delta Air Lines Inc. have posted fuel-hedging losses after oil prices tumbled from a record last year. 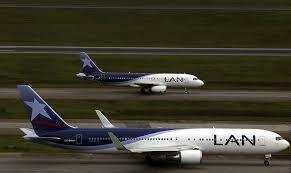 Lan’s sales fell as lower fuel-surcharges eroded gains from an 8.9 percent increase in passenger traffic. For the full year, the company said it expects passenger traffic to grow 10 percent, mainly from rising demand on domestic routes in Chile, Peru and Argentina. First-quarter profit was in line with the $67.6 million average estimate of four analysts surveyed by Bloomberg.